One of the joys of this hobby is discovering a great smoke that doesn’t cost much. 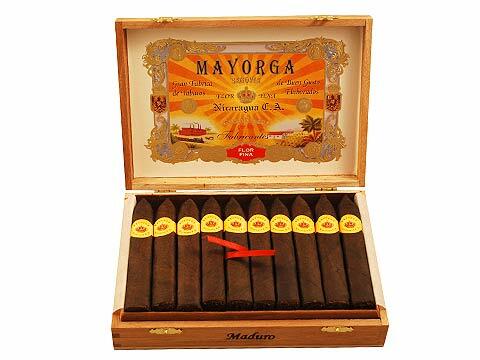 One of my favorite inexpensive cigars (marketing experts advice against using the word “cheap”) is the Mayorga. You’ll be impressed by the looks and construction. It’s a box press, almost square, and densely packed. The wrapper is smooth, with some veins and slight oily sheen. It burns evenly and draws perfectly. You’ll get tons of flavorful smoke, with notes of coffee, chocolate, and ceder. Over the length of the cigar the flavors get a bit stronger, but never overpowering. I buy these beauties by the box, but if they’re new to you, you might want to start with a sampler. The best prices I’ve found are at JR Cigar, where you can get a five-pack sampler for $15.60. That’s just $3.12 per stick!